The best place to draw and meet people at Greenbelt: the Tiny Tea Tent. Visited Greenbelt for one day this year and really enjoyed my day there. 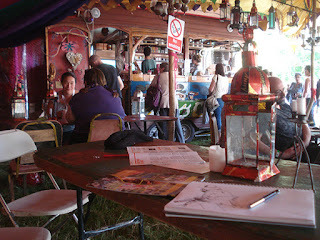 The Tiny Tea Tent provided endless varieties of tea but only one type of coffee. Not sure how my first cup of the day was brewed but the second, in the evening, came in a one cup cafetierre and was delicious. Apart from doing lots of sketching here and chatting to a few unknown people, managed to help light some of the many candle lanterns in the evening. Must return again sometime!